Everyday, as India awakes, 1.2 billion people need to be fed. By 2050 it could be 1.7 billion. Half a billion small scale farmers supply most of India's food. Traditionally, Indians have eaten the healthy cuisine of India's 29 states, but as people move to the cities there's a growing demand for fast processed food, the so-called 'junk food' accused of causing obesity and chronic health problems. Now India is a country on the edge of two possible futures: a future that's well fed and healthy; or a future with Western diets and Western obesity. With so many hungry people to feed, is it possible to eat in ways that are nutritionally and environmentally sustainable? What role do governments have to play in creating economic incentives for sustainable diets? "Fat or Skinny? takes a complex global issue and presents it in an engaging and accessible way. The interviews with teens and families in India about their own diets in addition to leading international expert talking heads add nuance to the discussion. 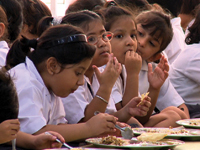 Malnutrition, both under- and over-caloric in India, is a useful lens for studying the global challenge of improving health in tandem with increasing prosperity." "Very interesting. Fat or Skinny? emphasizes that obesity does not stand in opposition to malnutrition or undernourishment, but rather is tightly related to them. It tackles an extremely important issue while showing different perspectives and succeeds at presenting a very complex problem in a fascinating way." "Fat or Skinny? is a very accessible portrayal of an all-too-familiar problem. Western viewers may be effectively surprised to learn that 'poor' countries suffer from weight issues like 'rich' ones, and they will be forced to ponder the fact that people can be fat and malnourished as surely as they can be skinny and malnourished. Suitable for high school classes and college courses in cultural anthropology, development anthropology, medical anthropology, anthropology of food, and Indian/South Asian studies, as well as for general audiences."